A few days ago, the value of all the bitcoins in the world blew past $1 billion for the first time ever. That’s an impressive achievement, for a purely virtual currency backed by no central bank or other authority. It’s also temporary: we’re in the middle of a bitcoin bubble right now, and it’s only a matter of time before the bubble bursts. There are a couple of reasons why the bubble is sure to burst. The first is just that it’s a bubble, and any chart which looks like the one at the top of this post is bound to end in tears at some point. But there’s a deeper reason, too — which is that bitcoins are an uncomfortable combination of commodity and currency. The commodity value of bitcoins is rooted in their currency value, but the more of a commodity they become, the less useful they are as a currency. Still, it’s worth taking a look behind the bitcoin bubble, because there are fascinating implications for anybody who cares about payments, or currencies, or trust. First, though, let’s go back to the night of Sunday June 12, 2011. That was the date of the first big bitcoin heist: a theft of such simplicity and audacity that it might well be considered the perfect crime. A man — we know him only as “All In Vain” — went to bed that night with his Windows computer turned on and connected to the internet. On that computer was a wallet containing 25,000 electronic coins. When he woke up on Monday morning, the wallet was still there. But the money was gone. Those 25,000 coins were, at the time, worth some $500,000; today, they are worth about $3.5 million. If All in Vain had noticed the theft within a couple of minutes of it happening, it’s conceivable that he could have got his money back. But he was asleep — and ten minutes after the theft occurred, it was utterly permanent and irrevocable. The only way All in Vain could get his money back would be if the thief were to simply transfer it back into his wallet. No one will ever find the person who stole All in Vain’s coins. That’s because the coins were designed, by another pseudonymous internet denizen known only as Satoshi Nakamoto, to be the perfectly anonymous payment mechanism for a digital world. That’s one of the things about bitcoins: once you send them, they’re sent. Similarly, if someone sends you bitcoins, you know for sure that you own them. You don’t need to know or trust the sender — all you need to know is that the coins have arrived in your virtual wallet, ready for saving or spending. Bitcoins were designed to be – and, in many ways, are – the perfect digital currency: they’re frictionless, anonymous, and cryptographically astonishingly secure. For anybody who’s ever suffered the incompetence of a bank, or bristled at the fees involved in just spending money, either domestically or abroad – that is to say, for all of us – the promise of bitcoin is the holy grail of payments. Especially since, to all intents and purposes, bitcoins are invisible to law enforcement and the taxman. Those strengths are also weaknesses. No one wants to risk losing millions of dollars worth of currency overnight, just because they were outsmarted by some computer hacker. The source code for bitcoin is free and public, which means that just about every hacker and cryptographer in the world has had a crack at it. And they’ve all come to the same conclusion: it really works. There are question marks over just how anonymous it is and just how scalable it is, but when bitcoins first arrived in early 2009 – right at the height of a massive global crisis of capitalism – they had immediate and magnetic appeal to the anarcho-utopian crowd of techno-libertarians who drive an enormous amount of innovation online. Nakamoto’s no paranoiac crazy: what he’s saying here is not all that different from what Warren Buffett wrote in his 2012 letter to shareholders. Investments that are denominated in a given currency include money-market funds, bonds, mortgages, bank deposits, and other instruments. Most of these currency-based investments are thought of as "safe." In truth they are among the most dangerous of assets. Even in the U.S., where the wish for a stable currency is strong, the dollar has fallen a staggering 86% in value since 1965, when I took over management of Berkshire. It takes no less than $7 today to buy what $1 did at that time. If you hold dollars, you’re trusting the US government not to destroy your wealth. Bitcoin, by contrast, is based on mistrust — it’s specifically designed so that it’s every man for himself. All in Vain was blamed by many in the bitcoin community for his stupidity: what was he thinking, keeping his wallet on a Windows computer attached to the open internet? But even with bitcoin, people nearly always end up trusting someone – and the entity they’re trusting often turns out to be unreliable. MyBitcoin, turned out to be a fraud; Mt Gox was hacked. The latest hot new bitcoin company is Coinlab, but given how much money can be made by hacking into these companies, and given that law enforcement authorities are unlikely to make any attempt to go after the perpetrators, there will always be a pretty substantial risk that clients will lose their money. The level of mistrust built into bitcoin is both feature and bug – most of us actually like being able to outsource our wealth-hoarding to some large trusted institution, rather than burying $1,000 under a black volcanic rock in a dry stone wall next to an old oak tree, or wrapping $90,000 in hundred-dollar bills in aluminum foil and hiding it in the freezer. Looking after your own coins is dangerous, and requires a pretty substantial level of tech-savviness. But trusting someone else to look after your coins requires the very trust that bitcoin was designed to circumvent. Some of these virtual currencies are roughly the same order of magnitude as Bitcoin in size, although it’s hard to make apples-to-apples comparisons. Revenues from Facebook credits are running at a rate of about $1 billion a year, for instance, and the market in QQ coins was so big in 2007 that the Chinese central bank, fearing that it was losing control of the money supply, cracked down on their use, calling on companies to stop trading in them. In this latest bubble, bitcoin transaction volume has managed to exceed $30 million in one day, and most days are seeing volumes of more than $5 million. That works out to about $2 billion in volume per year, so long as the bubble doesn’t burst. But the biggest difference between bitcoin and other virtual currencies is that bitcoins are the only one which have speculative value. What’s more, because they’re not tied to a corporate parent, bitcoins appeal to the web’s anarcho-libertarians in the way that no other virtual currency can. Bitcoins hold exactly the same gleaming promise for techno-utopians as gold does for Glenn Beck. They’re a scarce resource, and there’s no government or corporation which can control that resource. Bitcoins, like gold, are beholden to no government; they can’t be printed by any central bank, and they certainly won’t be subject to hyperinflation, since the global supply of bitcoins will never exceed 21 million. Like gold, bitcoins are mined; but unlike gold, no one can stumble over some large seam and make a fortune. Mining for bitcoins involves an enormous amount of computer power, and very little luck, and the global rate at which new bitcoins will be mined is both predetermined and slowing down. There were about 3 million coins outstanding at the beginning of 2010, there are about 11 million coins outstanding today, and we’ll get to 14 million in early 2014. Come 2021 or so, assuming bitcoins are still used then, the rate of growth of bitcoins will be so low that to a first approximation the money supply will be constant. This carries with it its own problems, as we’ll see. But there’s no risk that some central bank will print millions of new bitcoins, thereby diluting or inflating away the value of existing ones. As the reverberations from the financial crisis continue to echo, people betting on a decline of trust in government have been stocking up on gold and bitcoins. (Or rather, gold or bitcoins: although they can be equally zealous and vehement about their respective asset classes, there’s surprisingly little overlap between goldbugs, on the one hand, and the bitcoin community, on the other.) These are the perfect assets for rugged individualists, who trust their guns or their ultra-secure passwords more than they do their country. And in times of global turmoil, as we’re seeing today, such assets can perform very well. 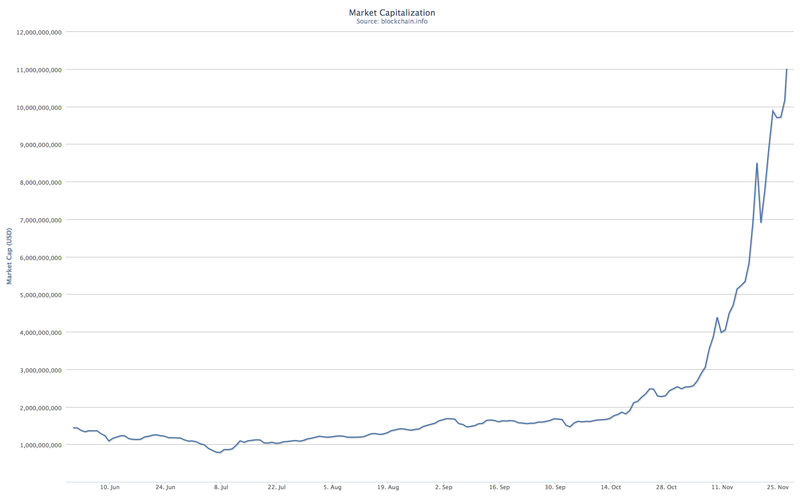 The immediate impetus for the current spike in bitcoin prices, of course, is the events in Cyprus. There, the government, under extreme pressure from the European Union, first proposed taking all bank accounts – even the insured ones – by at least 6.75%. That didn’t work, but now uninsured account holders at Cyprus’s two largest banks stand to lose most of their money. It’s a stark reminder of the dangers associated with depositing money in a bank. More generally, bitcoins could be emerging as a very useful currency in police states, or anywhere that monetary policy could fail catastrophically. At the end of 2011, for instance, there was a significant uptick of bitcoin activity in Belarus and Ukraine, two countries at severe risk of hyperinflation. If you want to protect your wealth from the policies of your national government, or from the inflationary policies of a heterodox central bank, then bitcoins can be a very good way of doing so in a largely undetectable manner. Of course, acquiring bitcoins in such countries can be non-trivial: there’s not a lot of liquidity on the major internet exchanges from people looking to sell bitcoins and buy the Ukrainian hryvnia. And even if there were, your local Ukrainian bank might frown on sending lots of hryvnia to Mt Gox. But it’s conceivable that people in Ukraine and Cyprus, especially information workers, might start working for bitcoins, spending them on goods and services, and introducing them into the local economy that way. At which point one can envisage the coins getting the same kind of status, at least among the information elite, that dollars had in the Soviet era. Bitcoins, then, are like cash — but they take the idea a step further than has ever been possible. If you give me a $100 bill, the transaction is anonymous and untraceable, but we both need to be in the same place at the same time. And it helps if we both live in a country where the US dollar is an accepted unit of currency. With bitcoins, transfers can take place across continents and timezones with no problems, no timelags, and only minuscule transaction fees. No banks are involved; no central bank controls the money supply; no taxes ever need to be paid. Once you’ve obtained a stash of bitcoins, they’re yours to do with as you like. And there’s lots that you can do with bitcoins. You can convert them into any of a dozen currencies, on various online exchanges. (Although at that point you’re going to start needing a bank account.) You can gamble with them in online casinos. Or you can just go out and spend them. The list of things which have been bought with bitcoins is very long, and is by no means confined to laptop computers and computer-programming services. Hotels take them, a sock manufacturer in Massachusetts is famous for accepting bitcoins, and the more enthusiastic members of the bitcoin community regularly do things like split checks at a restaurant – even one which doesn’t take bitcoin itself – by transferring coins to the person paying in dollars. And then, more notoriously, there’s Silk Road – a site which is not only a hub of bitcoin activity, but also played an important role in the first bitcoin bubble, the vertiginous rise in market value of bitcoins in 2011 which made the rest of the world sit up and pay attention to what was going on. Silk Road — and bitcoins — hit the public consciousness on June 1, 2011, a couple of weeks before the All in Vain heist. That’s when Gawker’s Adrian Chen published an article headlined “The Underground Website Where You Can Buy Any Drug Imaginable”. His post was viewed more than 1.5 million times, and caused a sensation, with Senators Joe Manchin, of West Virginia, and Chuck Schumer, of New York, writing an outraged (and entirely ineffective) letter to the Attorney General and the head of the Drug Enforcement Administration, demanding Silk Road be taken down. Bitcoins were – and still are – the only currency accepted on Silk Road, and overnight they became a speculative bet on the online future of illegal trading. The price of bitcoins, which had never before traded in the double digits, soared in just one week to as much as $33 apiece. The value of bitcoins, it turns out, is highly sensitive to media coverage: a year earlier, in July 2010, the influential technology site Slashdot posted a short item about bitcoin which sent the price soaring tenfold — from less than a cent to about 7 cents per bitcoin — also in a few days. And a single post on Time.com in April was enough to double the price of Bitcoins in a week, from 80 cents to $1.60. Even the article you’re reading now is appearing now because of the current bubble, and will, at the margin, help to continue to inflate it. For speculators, the math is incredibly compelling. If you spent $100 on bitcoins the day after the Slashdot article came out, those coins would have been worth $72,500 when the Gawker article came out just under a year later. And they would have been worth $250,000 a week after that. Today, they would be worth more than $1 million. There aren’t many perfectly legal investments which offer that kind of return. All of which helps explain the current bitcoin bubble as well. Each time the value of a bitcoin hits a new high or a new milestone, there’s more press coverage of the phenomenon, drawing new people in, and sending the value of bitcoins even higher. Indeed, if you chart the value of bitcoins against the number of times that they’re being talked about on Twitter, you’ll see a very strong correlation. And because of the Cyprus connection, mainstream publications have a handy real-world news hook, now, with which to explain the bitcoin phenomenon. Dollars are a universally accepted unit of account: if something in the world has a price, it has a price in dollars. Dollars are not, on the other hand, physical commodities. The overwhelming majority of dollars in the world are deposited safely and electronically in banks: there’s something weird and self-defeating about the kind of people who keep their savings stuffed under the mattress. In Hollywood, if you show someone counting out huge sums of cash, that’s an easy way for the director to say that he’s a criminal. Bitcoin was constructed to behave like a currency: it’s very easy to use bitcoins to pay for goods and services, especially if what you’re buying is in a different country. Right now, there’s literally no way to build a website selling some kind of service, and have a meaningful fraction of the world’s online population be able to pay you for that service. Bitcoin was designed to solve that problem; to be, in effect, the lingua franca of online commerce. But it’s very hard to be a currency when you’re also a commodity, governed by rules of scarcity and subject to speculative attack. And it’s also very hard to be a currency – or even a commodity, for that matter – when you’re as small as bitcoin is. Even now, at the top of a huge bubble, the total value of all the bitcoins in existence is the equivalent of about 2,000 standard gold bars -- not remotely enough to revolutionize the global payments and currency systems as we know them. Given the choice between something old and solid, on the one hand, and something new and virtual, on the other, the market is still voting for the asset class which has proved its worth over millennia. On a good day, at the top of the bubble, the trading volume in bitcoins can be more than $20 million. But by the standards of global currency markets, those kind of figures aren’t even a rounding error. The foreign exchange markets see volume of $4 trillion per day. That’s 200,000 times greater than what we’re seeing in the bitcoin market, and it happens on a regular, day-in and day-out basis. On top of that, there are really no traders in bitcoins, since for the time being it’s (almost) impossible to bet that the price of bitcoins will go down. As a result, there’s no reliable source of liquidity in the bitcoin market: there’s no bank or trading house which you can be sure will be there if and when you want to sell your coins. And just to make bitcoins even less attractive, it’s far from clear that bitcoins are even legal. The FBI is on the record as saying that “it is a violation of federal law for individuals… to create private coin or currency systems to compete with the official coinage and currency of the United States”. And laws against operating an unlicensed money-transmitting business have been used against electronic currencies in the past, and would seem to apply equally to bitcoin. The biggest problem with bitcoins, however, is conceptual: if they succeed, they fail. If millions of people started using bitcoins on a regular basis, the soaring value of bitcoins would actually be disastrous. You’ve heard of hyperinflation: this would be hyperdeflation. Take a gold bar valued at $600,000. At $60 per bitcoin, the value of that bar is 10,000 BTC. But then assume that bitcoins rise in value to $600 apiece, and then to $6,000, and then to $60,000 — as would have to happen if the fixed number of bitcoins was being used to store hundreds of billions of dollars in value. 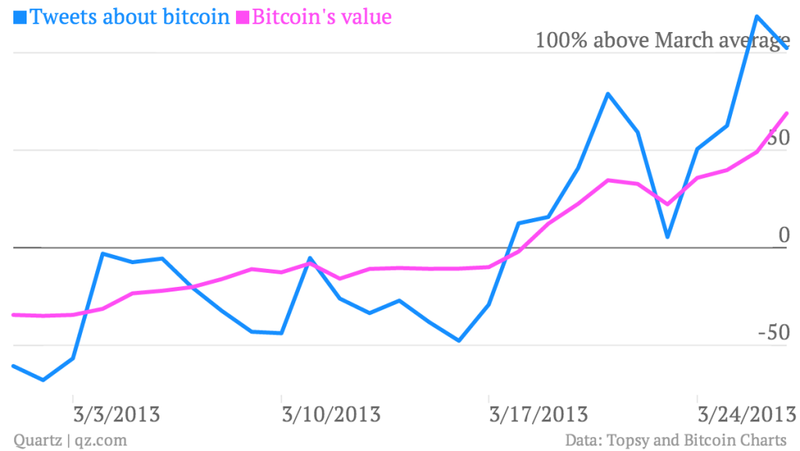 Then the value of the gold bar would plunge, in bitcoin terms — to 1,000 BTC and then 100 BTC and finally just 10 BTC. The same thing would happen to all other goods and services in the world, including your own salary. Everything would be constantly going down in price, if you thought in bitcoin terms. Inflation is bad, but deflation is worse. The reason is that in a deflationary environment, no one spends money — because whatever you want to buy is sure to become cheaper in a few days or weeks. People hoard their cash, and spend it only begrudgingly, on absolute necessities. And they certainly don’t spend it on hiring people — no matter how productive their employees might be, they’d still be better off just holding on to that money and not paying anybody anything. The result is an economy which would simply grind to a halt, with massive unemployment and almost no economic activity. In a word, it would be a Depression. In order to have economic growth, you need monetary growth as well — and that’s something which is impossible to achieve in a bitcoin-based system. Currencies such as the dollar, with a central bank which can print money at will, have succeeded for a reason. As economies grow, the money supply has to be able to grow with them. And that’s why bitcoin can never really succeed over the long term. Rick Falvinge, then, the founder of the Swedish Pirate Party who has invested his entire net worth in bitcoins, might be a multi-millionaire right now, but he is doomed to end up a poor and disappointed man unless he changes his mind. His coins will, at some point, become worthless, rather than turning him into some kind of visionary cyberbillionaire. But that doesn’t mean Falvinge isn’t onto something. There’s a lot to be said for a fast, efficient, peer-to-peer payments system which bypasses centers of authority and which has negligible transaction costs. It just doesn’t need to be its own currency. Historically, the government has subsidized the most common forms of payment – coins (which are often worth less than they cost to mint), notes, and checks. But it stopped doing that when credit and debit cards came along: Visa and Amex and Mastercard, as well as their web-savvy successors like PayPal and Square, are all run on a for-profit basis by companies looking to make billions of dollars by skimming off a small slice of every transaction. A peer-to-peer payments system, allowing anybody on the internet to pay anybody else on the internet without having to sign up with some financial-services behemoth first, could revolutionize global commerce. It would have to be able to work with any currency, including bitcoin; it wouldn’t need its own unit of account. It would have to be flexible, too: some transactions would be cashlike and irreversible, while others would allow some kind of chargeback. And, most importantly, it would work with, rather than against, today’s established monetary institutions. Yes, it would be disruptive, and could cost them quite a lot of money in terms of lost interchange fees from plastic cards and ATMs. But it wouldn’t aspire to delegitimize them – quite the opposite. Because it turns out that financial-services companies are a very important part of any democracy. Bitcoin, in that sense, is anti democratic. It’s based on mistrust rather than trust, it refuses to take any responsibility onto itself – indeed, it doesn’t even have a self to take responsibility onto. It’s nihilistic, and an attractive alternative only to things which are downright bad. And in any event, bitcoin is never going to work as a global payments system. Not only does it suffer from having a slow-growing money supply and a metastasizing transactions file which has to live on every user’s computer, it also encourages destructive computer hacking. The way that the money supply grows, in the bitcoin system, is by people harnessing the power of hundreds or thousands of computers to solve very complicated mathematical tasks, earning bitcoins for doing so along the way. And the easiest and cheapest way of doing that is to do so illegally, by stealth: set up a “botnet” of hacked computers to do your bidding for you. The incentives, here, are very bad indeed. I do have hope that in the future, someone, somewhere, is going to learn from bitcoin’s mistakes, and build a better system. One which needs less technological expertise to use; one which can grow organically, instead of only at a predetermined rate; one which is designed to be used primarily as a payments mechanism, rather than as a store of value and a unit of speculation. When that happens, cash will start looking decidedly anachronistic, as will wallets. We’ll have everything we need on our phones and in our web browsers, which we’ll be able to use for everything from paying for on-street parking to sending flowers to a friend in New Zealand to buying and selling shares of Google and Apple on the New York Stock Exchange. If we want to keep our money in a bank, we can; if we don’t, that’s fine too. And of course we can keep it in any mix of currencies we want as well. In the very early days of the world wide web, there were attempts to build a payments tag deep into the very architecture of HTML web pages. Those attempts failed, killed by a financial-services industry very suspicious of anything new. And as a result, the web has evolved along an advertising model, where instead of users paying for content, we have advertisers paying for users. But a universal payments system with no friction or interchange costs could change that model dramatically. And it would certainly help to level the playing field – for good and for bad – between skilled service-sector workers in countries like India and Russia and China, on the one hand, and their counterparts in countries like Germany, Japan, and the US, on the other. Payments walls, these days, are extremely effective barriers to trade, and if they come down, then we’ll get much more trade, with transactions getting orders of magnitude smaller than what we’re seeing now. The disruption – and the global wealth creation – could be truly enormous. It’s impossible to know when – or even whether – this is going to happen. Bankers in general, and central bankers in particular, tend to be extremely conservative, and anything which could facilitate money laundering or other illegal transactions is going to have a lot of difficulty getting traction. Bitcoin took off quickly because it never asked for permission; its successor is going to have to be a lot more diplomatic. But whatever it looks like, in the end, we can be sure of one thing: it will owe a very large debt to Satoshi Nakamoto and his audacious attempt to invent a whole new currency. Bitcoin isn’t the future. But it has helped to light the way ahead.